I smelled Diptyque’s John Galliano candle in Bergdorf Goodman some time ago, and thought it was a nice woody scent, but possibly not interesting enough for the price. Today I am wearing the matching room spray, and I have to say I’m considerably more captivated. According to Diptyque, the "subtle, woody scent is reminiscent of smouldering birch wood embers tinted with hints of iris and vanilla musk." It is also said to have notes of leather, moss and myrrh. The Essence of John Galliano fragrance was created by Olivia Giacobetti, the nose behind Diptyque Philosykos, Frederic Malle En Passant, and Hermès Hiris, among others. I read somewhere (sorry, can’t find the link!) that Galliano wanted to capture the scent of a Russian Orthodox church, and he has certainly captured the feeling of church incense in general. The more immediate association for me would be a bonfire: as advertised, this smells mostly like burning birch logs. This is a room spray, so it is understandably not a complex fragrance: what you get when you spray it on is pretty much what you get several hours later, although the smokiness does fade a bit. The real surprise for me was that it was still there several hours later; so many room scents have lamentably poor lasting power when worn as personal fragrance. Fans of Ginestet Le Boise, another smoky woods fragrance, might want to give this one a try as well. The iris & vanilla musk are very subdued, and there is a slight earthy undertone. I like it very much, but it just needs something more to translate to a personal fragrance: more depth, perhaps a bit more sweetness. 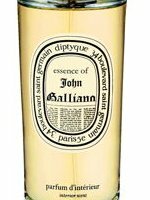 The Diptyque Essence of John Galliano candle is easily found online, but the room spray is harder to locate. I know Bergdorf Goodman had it when I was there, but that was some time ago. Galliano hinted some time ago in Women's Wear Daily that he planned to launch a personal fragrance line, but I have not seen another word about it, and Diptyque says they have no plans to issue this particular scent in an Eau de Toilette. Pity! Update: The Galliano Room Spray is now online at Barney's, and John Galliano has launched his own line of fragrances. This is the anti-Holly scent if ever there was one. Only to be topped by MPG's red fruity musky perfumes. Ginestet Le Boise, on the other hand, is very much my kind of thing! They don't remind me of one another…in any way. I don't get smoke in Le Boise…I get fresh cedar wine barrel. Woodsy perfumes forever! Long live us tree huggers! But I'll have mine without the fire & smoke, please. Now, young lady, are you spraying this concoction on your person directly or on the safe medium of some clothes? I also don't get burning woods in Le Boise. Although it would be nice because all winter I was looking for a cedar firewood fragrance! This stuff is really nice – but is it a bad thing to wear it on your skin? Lonestar Memories is a great scent, but haven't tried the Fracas for men. Hi Robin. I’m looking for an incense candle, as I don’t like burning incense sticks. I havn’t found any that are subtle enough for my delicate nostrils! I’ve looked for this galliano candle on-line, and can’t find it anywhere. Is it out of production? Also, do you know of any other incense candles out there on the market? Any advice would be gratefully received! If it’s incense scented candles you want, check out the Incense line of candles from Comme des Garcons. Luckyscent carries them. The scent you probably want is Avignon (a lovely rendition of church-y incense). They are expensive but are probably the most accurate version of an incense candle. Also on the upper end, Apothia makes candles in a couple of fragrances that have an incense-y vibe. Check out the scents “Soul” and “Spiritual”. Neither is a literal interpretation of incense, but both have an ambience that one might associate with a room filled with polished woods and burning incense. On the lower end of the price spectrum, West Elm used to carry a line of candles, one of which was called Incense. I don’t know if that particular scent is still available, but you may be able to find it on eBay if the store or website no longer carries it. As I recall, the West Elm incense candle had more than a passing resemblence to the smoke-y woody blast of Gucci pour Homme (v.2003 – not the newer, fresher version Gucci pour Homme II). In the meantime while you sort out your choices, a few drops of frankincense and/or myrrh essential or fragrance oil added to the melt pool of a Henri Bendel Firewood candle (Bath and Body Works) or Campfire candle (Target) might get you where you want to go with a minimum of fuss and money. what does the John Galliano perfume spray smell like ? I can only find it in department stores online. none of them have it instore. I don’t know, I’ve never smelled it. The first astonishing impression is of a dying woodfire. Living as I do in a bushfire prone area, I found that a bit startling, but not far under the ashes is the vanilla musc and iris. It leaves a wonderful soft fragrance on fabrics long after the bushfire has passed. I’m very tempted to try it as an EDT, although it needs a bit more of the sweet end of the spectrum to really succeed there. You can’t walk around this town with a bushfire sillage. I’ll take that back before somebody spots the error. I was, of course talking about the john galliano room spray, not the perfume. Mustn’t post replies deep into the night . .